A few years ago I posted an adulatory review of City of Sadness to an online forum, and was rebuked by a peer who had seen the film and deemed it tediously inscrutable. Objecting to the film’s dense orientation in Taiwanese history and culture, he chided, “I shouldn’t need a history book to enjoy a good movie!” Part of me agreed with his complaint, insofar as it espoused an appreciation for cinema in its most autonomous form. But as our debate continued, with my colleague insisting that Hou should have used techniques like voiceover or montage to distill the film’s historical background in a more accessible manner, the definition of a pure, autonomous cinema began to shift. A distinction emerged between two kinds of films: one in which the film revolves around the viewer, and one in which the viewer revolves around the film. I estimate that 80-90% of movies are made under the first premise. City of Sadness is unmistakably of the latter camp; in fact, it’s one of the best examples I know of a film that seems to exist independently of a viewership, self-contained in its own evocation of a specific time and place. But if there is such a film that does not regard the viewer, what reason does the viewer have to regard it? It’s bad enough that City of Sadness remains inaccessible, even among Hou acolytes due to its disgraceful unavailability on English-subtitled DVD. But even if people were able to get their hands on this film, would they get it? The problem of requiring a specific cultural familiarity to fully appreciate City of Sadness is a real one, moreso than in Hou’s recent films that have been released in the US and thus have enjoyed greater popular renown. Ironically, Hou’s recent films could be seen as the chronicles of dealing with settings unfamiliar to him: the Paris of Flight of the Red Balloon; the Tokyo of Café Lumiere; even the youth-centric Taipei of Millennium Mambo (which one of my friends denounced as a man’s pathetic reckoning with midlife crisis; I disagree about it being pathetic). While these films are as concerned with the experience of time and the forging of personal history as his earlier work, they rely more on the “pure cinema” techniques of observational long takes and virtuoso camerawork. (There was a time when Hou never needed a tracking shot to establish a presence; now he has Mark Lee Pin-bing’s camera roaming rooms like an animal staking out its territory). Hou’s sole recent foray into the past is Three Times, whose insights rest upon a Griffithian gimmick of chronological contrasts, diluting his characteristic intense rendering of time and place. Hou is still a master at what he does, but it’s a much less stunning array of skill, ambition and personal insight than what can be found in City of Sadness. Any given scene in City of Sadness has its own internal history informing the logic of its characters’ behaviors. Hou’s sense of dramatic conflict—one that’s unique in cinema—arises when the recurring presence of the past collides against an unfolding present unknown to both the characters and the viewer. 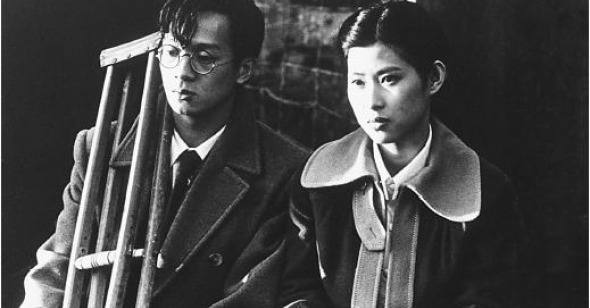 At the film’s beginning, upon the Japanese withdrawal from Taiwan at the end of World War II, a Japanese girl’s offering of a samurai sword to her would-be boyfriend’s sister is the only gesture she can make to commemorate her forsaken future. A Taiwanese man accosts a prostitute last seen with his murdered friend, not realizing that she’s protected by the recently arrived Shanghaiese gangsters likely responsible for the murder. Fomenting grudges lead to fight scenes whose messy, unpredictable quality are unlike those in any other film (if only Hou had followed through on his plans to film a martial arts movie!) City of Sadness envisions a massive shift in a tiny island’s social fabric caused by forces well beyond the scope of any person, or even a community. Everyone is overwhelmed. No less than five languages are spoken in the film: Japanese and four forms of Chinese (Taiwanese, Shanghaiese, Cantonese and Mandarin—one of the film’s funniest scenes involves a meeting among rival gangsters requiring multiple translators). Even Chinese viewers require subtitles when watching this film. City of Sadness embodies a cinema that reflects the despondent fragmentation of modern existence, and is as relevant as ever in today’s world. John Simon once called Persona the cinematic equivalent of Joyce’s Ulysses, presumably because the two shared the distinction of being the most intensely intimate expressions of human consciousness of their respective mediums. Perhaps in this case one man’s Hamlet is another man’s King Lear, but if I were to describe the achievement of Ulysses, it would be its multifaceted summoning of a place and its people, opening a door to the infinite expanse of their lives. With all due respect to Open City, The Magnificent Ambersons and virtually any film by Ozu or Tati, among cinema masterpieces City of Sadness comes closest to fulfilling this aim. How much one needs to understand the contextual background of City of Sadness is tantamount to measuring how much one needs to understand Dublin circa 1904 to appreciate Ulysses. The paradox inherent in both these landmarks of 20th-century art is the paradox of 20th-century art itself: to establish any statement of universality requires burrowing deep into the specificities of experience. The overwhelming gusto with which Joyce throws himself into bringing Dublin to life is an awesome feat that leaves one feeling that this kind of sprawling, copious encapsulation of life could be written about any time or place, but it took Joyce and Dublin to make it happen. The same is true of Hou and City of Sadness, a film rooted in the contradictions and conflicts of its politically beleaguered island nation. I can’t possibly probe all of the film’s depths in this article, but resources readily exist that can aid in one’s exploration of the film. Berkeley's City of Sadness Multimedia Site [http://cinemaspace.berkeley.edu/Papers/CityOfSadness/table.html] is one of the first, and still one of the best examples of how the web can explicate the wonders of a given film. Its non-linear, hypertextual presentation offers a multiplicity of perspectives and ways to engage with the film, and as such it suits the Hou’s work quite aptly. Berenice Reynaud’s 2002 monograph for the BFI, the first and hopefully not the last book-length study, offers brief and helpful summaries of the film’s complex narrative, historical and cultural background, key cast and crew, and explores its themes of history and personal narrative, as well as its handling of sound and space. One of Reynaud’s observations concerns how the multiplicity of City of Sadness reflects the tragic quality of Chinese and Taiwanese culture: “The wound of fractured identity, the sadness of not being able to understand other Chinese.” In his nonplussed evaluation of the book, critic Stephen Teo responds, “I wonder whether such a statement would sound as poignant coming from a Chinese writer attuned to the reality of fractured identity." While there is some point in discerning a person’s ability to speak from a position of genuine experience, Teo’s remark leaves an insinuation that the wonders of City of Sadness are best left for Chinese viewers to appreciate and explicate. If only the reality were that simple. Upon its release, as many Taiwanese viewers were as frustrated as those who celebrated this taboo-breaking film, the first to deal with one of the darkest moments in their nation’s history. On February 28, 1947, an estimated 18,000-28,000 native-born Taiwanese were killed on the streets of Taipei during protests against the Nationalist Chinese government, leading to decades of authoritarian rule. Public mention of the incident was forbidden until martial law was lifted in 1987, only two years before the release of City of Sadness. Perhaps due to being the first movie to deal openly with the “2-28 Incident,” or perhaps because of the Golden Lion it won at Venice (an unprecedented achievement for a Taiwanese movie), City of Sadness was the top grossing domestic film of its year. Nonetheless, there was public dismay at the oblique nature of Hou’s storytelling and the fact that the atrocities of the “2-28 Incident” are never depicted directly onscreen (despite that there are more fight scenes and onscreen killings in City of Sadness than in all of Hou’s other films combined). As Hou moved on to even more studied explorations of history and cinema in The Puppetmaster (1993) and Good Men, Good Women (1995), City of Sadness is decidedly Hou’s last film targeted towards the popular audience his early films had steadily cultivated throughout the 1980s renaissance of Taiwanese cinema. - Historical memory is impersonal. - My experiences don't belong to me. - The shot's centre of focus is forever drifting out-of-field. - We are clusters of signs and affects given form by light. The sequence that most beautifully embodies these principles occurs at a dinner among young political intellectuals, as well as Hinomi and Wen-ching. Much of the scene is shot statically facing the table, with the intellectuals engaged in dour discussion of the many abuses of the government upon the Taiwanese people. One barely notices Hinomi (positioned furthest back in depth around the table) or Wen-ching (whose back is turned in the foreground). Wishing to brighten the portentous mood of the conversation, Hinomi signals to Wen-ching to help pick an LP record to play—ironic since Wen-ching is deaf. In his scene, Hou mixes history, politics, art and everyday life in such a way that they do not supersede each other, but alternate. As the human consciousness shifts from one mode to the next, so does Hou’s frame of action. I could hear before I was eight… I remember the sound of a goat bleating… the voice of the singer in the local opera. Cut to a shot of an opera singer singing in a courtyard, followed by images of schoolchildren assembling for class nearby. One child starts pantomiming the dance of the opera singer. Is this Wen-ching as a boy? But more importantly, whose flashback is this? Is it Wen-ching’s memory of himself, or is it Hinomi’s imagining of his memory? This beautiful moment belongs neither to Wen-ching or Hinomi, but to anyone who sees it. It is the lasting testament of City of Sadness that it awakens us to realize that the wonders and tragedies that we experience belong not just to us, but beyond us. The Taiwanese viewers who were frustrated with not being able to see past atrocities on screen didn’t want simply to commemorate the 2-28 Incident; they wanted desperately to gain possession of them through spectatorship. This has been one of the key tenets of political filmmaking throughout history: enlightening and empowering audiences by allowing them to bear witness to injustice. While Hou could be faulted for being a poor polemicist, his film remains a rare and genuine attempt to explore not what happened in history, but how history works. As in so many of his other films, the experience of watching City of Sadness is to be confronted with one’s lack of knowledge about where the story is going, a sensation that, as much as one desperately attempts to avoid it, applies to one’s own life. Scenes pass like clouds, loosely connected, the overall story arc not clearly in sight, and only in retrospect, with a final shot of an empty room that once held scores of family and friends, does the sum total of the film materialize, narrative, historical, emotional. Hou’s aim is nothing less than to enact how people live history—not as something happening right in front of them, but around them and beyond them, the same way then as now. In City of Sadness the horrors of the world occur almost always out of view, but it makes their presence all the more unsettlingly palpable. Serge Daney once asked, “What absence from the world will later make being present in front of the images of the world necessary?” Sometimes to acknowledge how there may be things we do not know can make us more accountable to what we do.